1. There is an ayin that looks like it has an extra tag (4 taggin instead of 3). See pic. Does this pasul it? Can it be removed? 2. The nun from the word "pen" has a flat, wide head. Is this problematic? the extra tag hanging in air should be erased, in any case [bdieved as is, is] kosher. the nun cannot be corrected [because of space that will be left between the nun and pay' to its lechatchila measure, so] is kosher. What about the Kotzo Shel Yud (both) in "Yih'yeh"? R. Moshe - thanks for the answer. 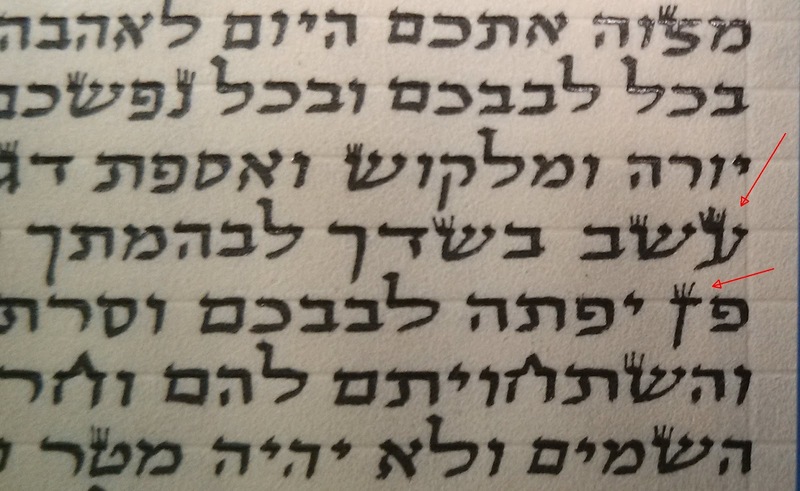 What minhag is the writing? The "heh" leads me to think it is Sephardi, but the "shin" looks Ashkenazi. Its hard to see if the yudim are a sharp square angle or rounded. 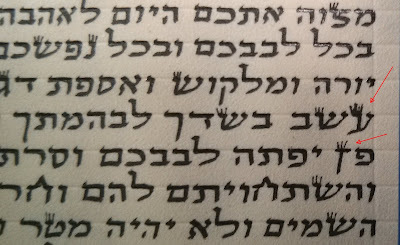 Bediavad יהיה seems kosher as is but the kotz tachton should probably be added (by a qualified sofer) since from what I can see some of the other yudim look like they have kotzim at the bottom left. But then in that case there are other yudim there that would probably require this too.